Despite feeling a bit under the weather this last weekend, I still managed to take about 3 hours to go through all my clothes and revamp my whole closet scheme. I managed to part with almost 60 items of clothing and/or shoes, and I felt so invigorated by the whole business that I made Matt drive us to the D.I. stat so that it could be out of our lives for good. You know, it’s funny because for a long time, I thought I was addicted to holding onto everything, and I seemed unable to part with even the littlest trinket (mostly due to me not liking to deal with the feeling of loss when you get rid of something that holds sentimental value but is no longer of any use to you). But now I think I’m addicted to this feeling of taking all these bags of stuff out the door–it’s like with each bag, I can almost feel a weight being lifted off. I remember this one time that my sister Hannah (a massage therapist) was doing some energy work on me. She told me to envision that I was putting all the junk and baggage from my past into big plastic garbage bags and taking it out to the curb. I still remember how liberated I felt after that session with her, and I find it only fitting that I feel liberated now that I’m taking the literal junk out of my life, too. So that’s the truth, then: getting rid of the junk is equivalent to the best therapy. 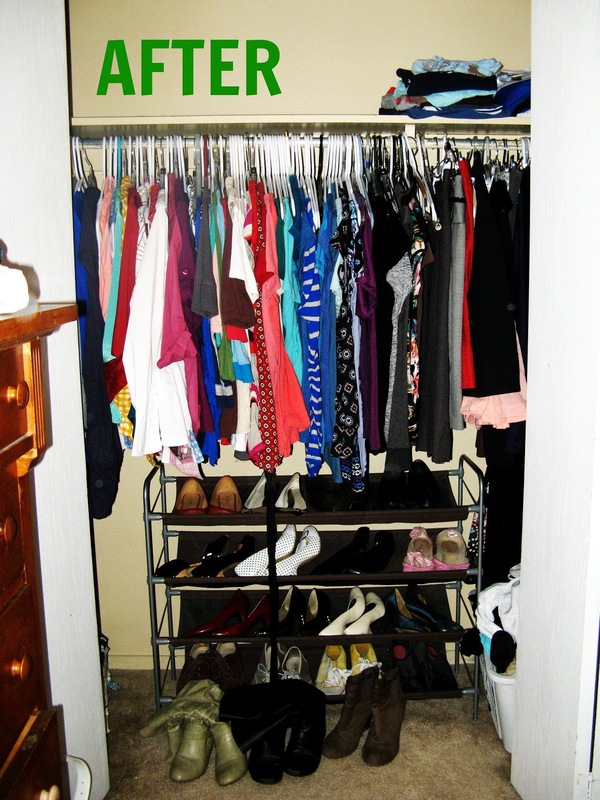 Now, I re-did my closet scheme back in 2011, and I had originally switched away from my typical color-coded closet to doing one that was more by type (dressier shirts in one section, t-shirts in the middle, my little section of prints on the right, jackets and sweaters off to the side, etc.). However, I found that there were some serious problems with that plan because since I’ve been doing a bit of style reinvention, I’ve discovered that I can no longer separate dressy shirts from t-shirts because I’ve learned that you can really dress up or dress down nearly anything. 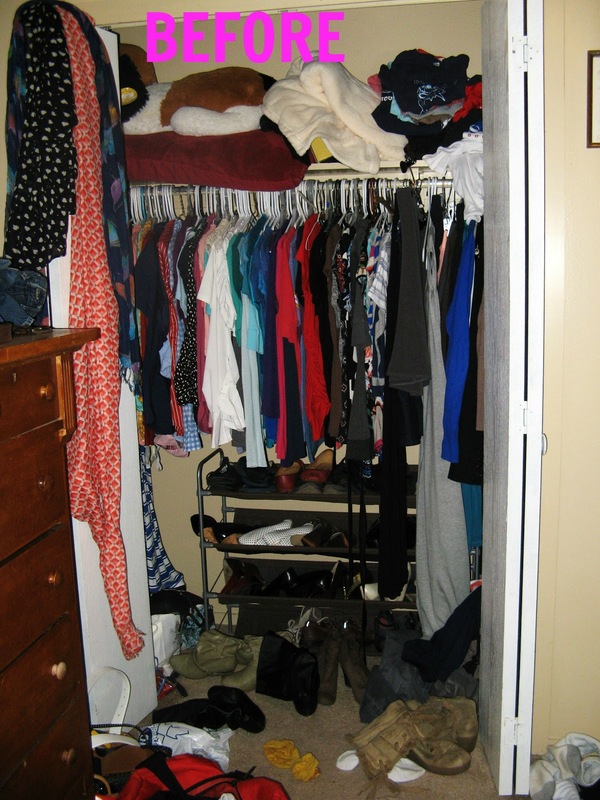 Thank goodness we have a big closet. Matt got in on the fun too and got rid of some of his own stuff too (although since his wardrobe is about a tenth of mine, he got rid of quite a bit less than I did). Overall, I’m just excited that my closet can BREATHE again. Here’s a picture BEFORE our trip, so you can only imagine how bad it’s probably going to be after. 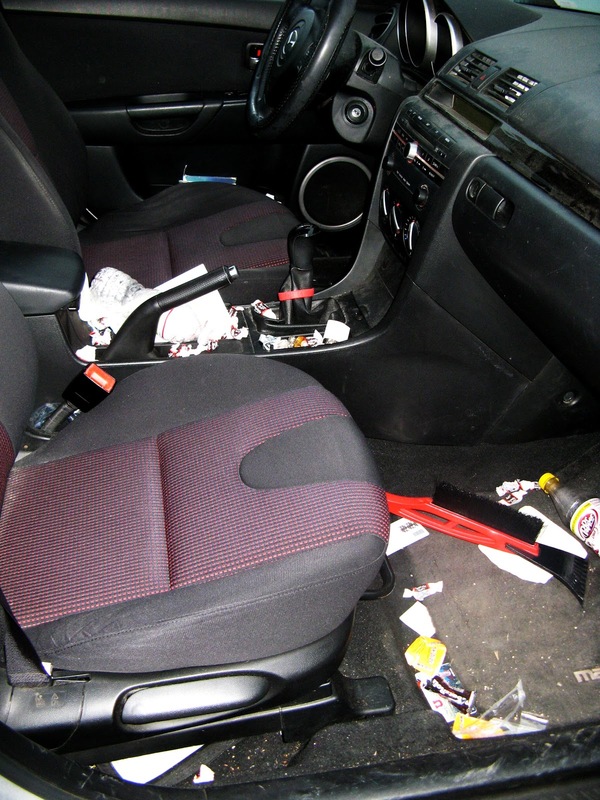 *Remove all garbage and items that do not belong in your vehicle. Don’t forget the trunk! *Take out all floor mats and shake them out. *Clean out the glove compartment. *Vacuum the interior. Dust and wipe down the dashboard, drink holders, and doors. *Place all CDs in a case. *Attach a trash bag to the back of one of the seats or the console and be sure your family uses it. *Place loose items in the trunk in containers so they do not slide around as you drive. *Schedule an oil change or do it yourself. *Put together or update your emergency kit, which should include: a well-stocked first-aid kit, road flares, a flashlight with extra batteries, and everything needed to fix a flat. *Collect all information pertaining to vehicle repairs and maintenance and keep it in one location, such as the glove box or a file in your home. 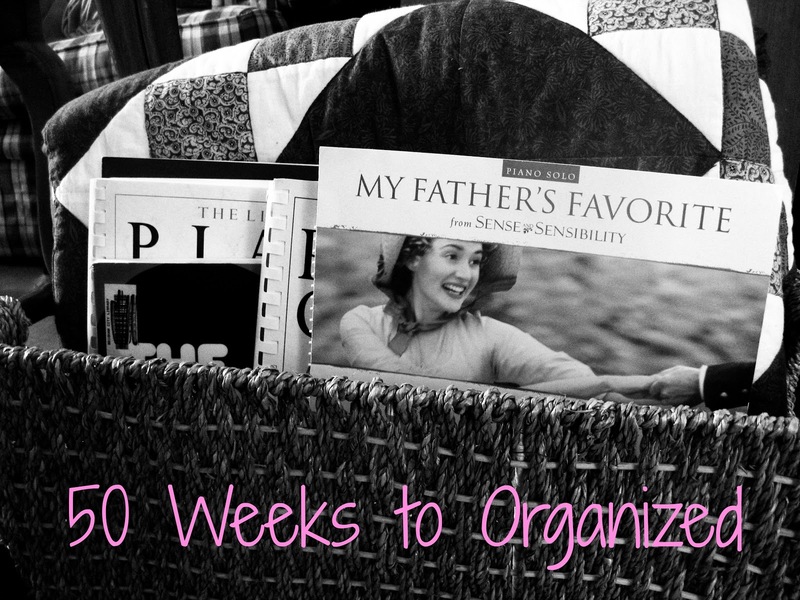 What are your strategies for keeping the clutter out of your car?